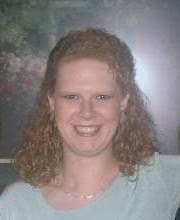 The Graveyard Rabbit: Meet: Amy Crooks, author of "Untangled Family Roots"
Meet: Amy Crooks, author of "Untangled Family Roots"
So how did my interest in genealogy and cemeteries begin? That’s a complicated question and a long story. But I promise to keep it somewhat short. Let’s start by saying I grew up with a slightly strange childhood. 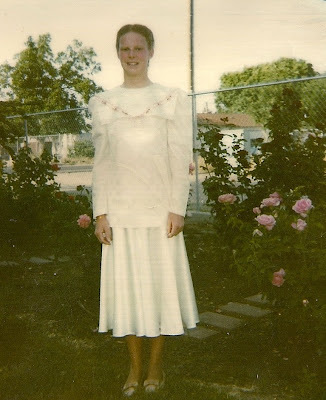 My parents literally belonged to a religion known as Old Fashioned Pentecostal, and that was not an understatement. I think the picture says it all. 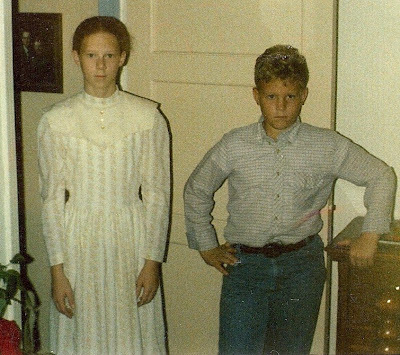 We look like we were time warped from the 1880’s, not growing up in the 1980’s. As part of that religion we were not allowed to watch television, could not read fiction, could not go to amusement parks, and of course the other sins like no gambling, drinking, and a lot of other things I didn’t care about as a kid. As a result I became a child that went to museums, national parks, ghost towns, and cemeteries in California where I grew up instead of amusement parks. I read non-fiction books, usually based in history and biographies, of course that also served as my entertainment since I couldn’t watch television. My dad use to call me his “little bookworm” because I always had my face in a book. Cemeteries never scared me. I never grew up watching scary movies, to even learn that. Instead they were a real fascination to me. I would visit graves and read some inscription and wonder what their lives were really like, why they died so young, how a mother could bare to loose so many children, and so many other things would go through my mind. One of my most poignant memories is on a visit to Columbia, CA. At that time it was a tourist attraction and otherwise a ghost town. Back behind the little red school house was the town cemetery. One of the headstones there, I believe near the entrance, was very large and laid flat on the ground. Part of the inscription said “stabbed to death for one gold nugget.” I never forgot it and would love to visit there again. Unfortunately I live to far away now. The other seed that was planted was by my dad’s mother. I remember sitting with her on her front porch. She lived behind us. I was about eight. We were talking about a project in school that was about Daniel Boone, and she told me that she had once seen a book written by a family member that had us related to Daniel Boone. He wasn’t an ancestor, but she couldn’t remember how he was related. Sadly the book had been lost in a fire and she was never able to find out more. I have yet to find that connection, but I’m always looking. Okay so my childhood was a bit strange, but finally when I was sixteen I got to step into the 20th century and be an active part of it. I will never forget what my dad did for us that day. It was in October of 1991 when he finally made the decision to quit the church. Although Mom gave him the ultimatum of the family or the church, but he couldn’t have both and continue to make us kids miserable. He chose us, and you’d have to understand that my dad was deeply involved in the church. But he loved us more. So that October for the first time since I was four (when my parents started the church) I was able to wear pants. Talk about being the talk of school that next Monday! I think everyone was in shock, especially the boy who still noticed me even in dresses. That brings me to the next phase of my life. Fifteen years later I am still married to that boy who took notice of me when I was the strange looking girl with her face in a book. I didn’t really notice him until the next year, but he knew who I was. We finally started dating in our Junior year and were married in November of 1993 just after we graduated. We have three beautiful children, Christopher – 11, Justin – 7 and Jamie – 4. Jamie was the one to launch me into this phase of my life. Just before she was born I made the decision to be a stay at home mom. I quit work a few weeks before she was born. I was so bored one month later that I thought I would go insane. I was doing puzzles (which I’ve always loved) and my cross stitch needle work, but I was even growing bored of that. So one day while watching one of my favorite shows even to this day, Little House on the Prairie, I began to wonder what the real Laura Ingalls was like. Now the internet today is an amazing thing. So I got online and began looking for history on her and the family. I loved some of the stories I read and the old pictures I saw. I began to wonder about some of my own ancestors when I stumbled across an ad for a two week subscription to ancestry.com………and as they say the rest is history. That was about four years ago and I’ve never stopped looking. I have been blogging on my Untangle Family Roots blog now for about three years or so. I volunteered to host the Kootenai County, ID site for Genealogy Trails since I live here, but had to give that up when I had to go back to work about a year and a half ago. It’s been a rough two years for my husband with jobs. But finally we are getting back on our feet and I can pick up some of my old projects. I may host that site again, but really my passion was taking me in the direction of preserving the history of old cemeteries. My biggest project is that of Kootenai County Cemetery aka Old Paupers Cemetery here near my home. I started to write some of the history on my blog and began to write about those buried there when Grave Yard Rabbits found me. It was a perfect fit for my research and I joined in a heartbeat. I was a volunteering for RAOGK and Find-A-Grave until it got to be too much with work and now not having a second vehicle. Fortunately I have the privilege of working with my parents, so they pick me up and the missing vehicle isn’t a real hardship. One person at work reminded me how lucky I was to spend so much time with my parents, especially since I have a real passion for preserving our family history. She told me she’d give anything to be able to sit with her parents on her lunch at work and hear more stories from them. And from time to time I do get that privilege when we get off on an old family story or try to remember something we all did together. I try to record as much of that as I can. What an interesting life history you have had, Amy. And you bring a unique viewpoint and writing style to your blog. I really enjoyed reading about how you got interested in genealogy. Thanks for sharing your portion of life with us Amy. I so enjoyed reading your article. You inspired me to write also. I am interested in buying your book but I don't have a way to contact you.